Get ready! October is an amazing time to be in New Orleans, and we’re not just talking about Halloween. October is packing over a dozen music and foods festivals alone, not to mention the milder temps you’d want to be here for. Here are the highlights of what’s going in New Orleans in October. For the fourth year in a row, Tremé Fall Festival throws a weekend-long party in the blocks of Henriette Delille and Gov. Nicholls Streets. The festival honors the unique history and heritage of the neighborhood and benefits its many cultural destinations, including the oldest African-American Catholic church in the United States, the historic St. Augustine Church (1210 Governor Nicholls St.). The donation-based fest will have arts and craft vendors, face painting, free health screenings, tours of St. Augustine Church, and, of course, entertainment from New Orleans musical royalty. Tremé All Stars, Olympia Brass Band, John Boutte, Hot 8 Brass Band, and Dwayne Dopsie & Zydeco Hellraisers are all scheduled to perform. The Tremé Fall Festival closes out on Sunday, Oct. 7, at St. Augustine Church, beginning with a gospel mass at 10 a.m. and followed by free concerts from noon to 3 p.m. The beignet, little fried pockets of doughy goodness ideally dusted with alpine levels of powdered sugar, is no longer going without its own celebration thanks to the annual Beignet Festival, which returns for its third year on Saturday, October 6. The daylong party is free and will take place at the Festival Grounds in City Park (4 Friedrichs Ave.) from 10 a.m. to 6 p.m. As you may expect, there’s going to be a whole lot of delicious sweetness going on (and a fair bit of savory too). From traditional sweet treats swimming in powdered sugar to savory options bursting with seafood and cheese, Beignet Fest will feature more than 30 beignet dishes from some of New Orleans’ best restaurants and food trucks. Katie’s Restaurant’s crawfish beignets, The Ruby Slipper Cafe’s cochon beignets, and Luca Eats’ past years’ winner Oreo beignet are all coming back, as well as the Best Overall Beignet 2017 winner crabmeat beignets from Loretta’s Authentic Pralines. The festival also features live music, a kid’s village, and the artist market. The musical lineup stretches for the whole day and includes Imagination Movers, Eric Lindell, The Original Pinettes Brass Band, Soul Project, and more. Presented by the New Orleans Jazz and Heritage Foundation, the free, over-decade-old Crescent City Blues and BBQ Festival always sports an eclectic lineup, consistently booking a mix of young talent alongside seasoned blues veterans. And that’s before you even consider the wide variety of BBQ vendors that surround Lafayette Square throughout the weekend. Just like in the past years, there will be two stages of music and a huge arts market. Headliners this year include award-winning Louisiana blues artist Walter “Wolfman” Washington, guitar legend Jimmie Vaughan, world-famous blues belter Shemekia Copeland, Memphis R&B icon Don Bryant, the beloved Little Freddie King, Shereveport native Papa Mali, and more. As always, the event will include copious amounts of barbecue, with some of the best barbecue vendors in the region. Past vendors have included McClure’s, Blue Oak BBQ, The Joint, and many, many others. The spread will honor several regional styles, with an emphasis on Louisiana — made easier than ever with the recent proliferation of BBQ restaurants on the New Orleans dining scene. Beyond BBQ, there will be, of course, options for vegetarians, plus vegan and gluten-free fare. The WWII Air, Sea & Land Festival will take place on the grounds of the New Orleans Lakefront Airport and will feature live entertainment and guest speakers. There will be air shows showing off historic aircraft, military vehicle demos, WWII veteran interviews, and other thrilling interactive experiences. For kids, the fest will feature obstacle courses, rock climbing and inflatables. You can also take a free shuttle to the Lakeshore Landing dock to tour the PT-305, a fully restored, combat-veteran patrol-torpedo boat. Single-day tickets are $25. Children 12 and under are free. Weekend passes are also available. You can even book a ride on some of the warbirds here. The vibrant celebration of the National Hispanic Heritage Month (September 15 – October 15) ends in grand style on Saturday, October 13, with the 19th annual Carnaval Latino. The free festival is organized by the Hispanic American Musicians and Artists Cultural Association, Inc. (HAMACA) and will have Latin music from different parts of the world, food and drink, art, and, of course, a parade. The festivities will be kicked off with the annual Parade of the Americas, or “Desfile De Las Americas,” a fun and unique way to celebrate the city’s tricentennial and the National Hispanic Heritage Month. The pre-parade party starts at 2 p.m. in the Washington Square Park (700 Elysian Fields Ave.), featuring DJs and authentic Latin cuisine from the local vendors including Los Jefes and Agave House. The parade will form on Elysian Fields Avenue by Washington Square Park by 6 p.m., rolling through the French Quarter with about 20 of Krewe of Quetzal’s floats accompanied by the marching folkloric groups and bands, all featuring costumes that celebrate national roots. This year’s Queen is Christina Rodriguez-Fierro, a Loyola graduate and the first-year medical student at LSU. To date, the New Orleans Film Festival is one of the largest film festivals in the South and is the longest-running one festival of its kind in the state. The festival has grown to the point of attracting thousands of attendees and industry insiders, plus more than 400 filmmakers and over 200 films annually. It also has a stated commitment to diversity, with 60 percent of the featured films created by women and gender non-conforming filmmakers, and 54 percent or more are productions created by filmmakers of color. While it’s impossible to list all 220 films chosen to be showcased this year, there are certainly some standouts. The festival’s opening night kicks off with a screening of Peter Farrelly’s Green Book, starring Viggo Mortensen and Mahershala Ali, and shot in Louisiana. This year’s centerpiece film is Widows, directed by Steve McQueen (12 Years a Slave) and co-written by bestselling author Gillian Flynn (“Gone Girl”, “Sharp Objects”). The star cast includes Liam Neeson, Colin Farrell, Robert Duvall, Daniel Kaluuya, Michelle Rodriguez, Lukas Haas, and others. This year, Louisiana-made films make up 27 percent of the lineup. The stellar feature lineup representing the state includes the well-reviewed Buckjumping by Lily Keber as well as A Man and His Trumpet: The Leroy Jones Story by Cameron Washington, which is a portrait of legendary New Orleans trumpeter Leroy Jones, who spearheaded the New Orleans brass band revival. The fest will close with a screening of A Tuba To Cuba by directors T.G. Herrington and Danny Clinch, which features Preservation Hall Jazz Band. Screenings start at $9; all-access passes are also available. The 10th annual Praise Fest is a free outdoor event that will be held from 11 a.m. to 6 p.m. on each day on the bank of Bayou St. John, where Orleans Avenue meets Jeff Davis Parkway. The family-friendly event features live performances from local and national gospel and soul artists and speakers, drawing a diverse crowd of thousands. Eric Waddell, Frank Thompson, Dewayne Woods, Drea Marie, and many more are scheduled to perform this year. Friday is also designated a Senior Day, while part of Saturday’s lineup is a Health & Career Fair. This new country music fest will be held at NOLA Motorsports Park, a racetrack in Avondale, approximately 20 minutes from downtown New Orleans. The three stages have a packed lineup, with Justin Moore and Louisiana’s own Hunter Hayes headlining. Country Smooth, a whiskey brand sponsoring the fest, will be selling its product there. Country Smooth Festival is family-friendly, also featuring go-carts and an air-conditioned VIP area. One-day passes are $60. Krewe of Boo is one of the city’s most impressive parades outside of carnival season. This Halloween procession kicks off at 6:30 p.m., starting at Elysian Fields Ave. and rolling through the Quarter to the Warehouse District. Expect plenty of floats, dance troupes and throws, all themed after monsters, spooks, and general ghostly goodness. The fun ends at Generations Hall (311 Andrew Higgins Dr.) with the Monster Mash party. This ticketed costume party starts at 8 p.m.; ages 18 and up to enter ($20-$80). Additionally, that morning the Krewe hosts its annual New Orleans Zombie Run. This two-mile race starts at 9 a.m. and ends at noon, both at the Lucy’s Retired Surfers Bar & Restaurant (701 Tchoupitoulas St.). Participants are encouraged to come dressed as zombies and monsters. Registration for the race begins at 7:30 a.m. You can pre-register online, and tickets are $20. New Orleans will be holding its second Mac N Cheese Fest on Saturday, October 20, from 11 a.m. to 6:30 p.m., at the Louis Armstrong Park (701 N. Rampart St.). The free fest will feature dozens of mac ‘n’ cheese dishes from Louisiana restaurants, pop-ups and food catering businesses. You can pre-order food and drink tickets here for pickup at the main entrance on the day of the fest ($10-$100). The inaugural festival was such a success several vendors even ran out of their offerings before the day was over, so this year festival organizers are increasing the number of participating vendors from the last year’s 15 to accommodate the fest’s growing popularity. The mac ‘n’ cheese dishes will be judged by a panel of professional and celebrity judges in two categories: Overall Winner and Kid’s Choice Award. The live music lineup is scheduled for the whole duration of the festival and will be booked House of Blues, one of the fest’s sponsors. This massive annual undertaking has started small, eventually becoming a mega fest with thousands of attendees and big headliners. In its 20th year, Voodoo Fest is considered second only to the New Orleans Jazz & Heritage Festival in attendance. The fest will be held on Halloween weekend at the New Orleans City Park Festival Grounds (4 Friedrichs Ave.). This year’s lineup is as stellar as always, with Arctic Monkeys, Childish Gambino, Modest Mouse, The Revivalists, Third Eye Blind, Marilyn Manson, Mumford & Sons, Janelle Monáe, and many more. General-admission 3-day passes are $155, and $75 for one day. Because parking will be limited we recommend hopping on the streetcar that runs along N. Carrollton Ave. and will bring you right to the City Park. In New Orleans, Halloween is much more than just a night for kids to go treat-or-treating, although there’s much to do with the little ones for Halloween too. Teeming with costume balls, street parties, and, of course, the Krewe of Boo parade, the two weeks leading up to the day itself are packed with some ghoulish, outlandish treats. Not to be confused with another, Halloween-weekend Voodoo Fest, which is a massive music festival, Voodoo Authentica‘s VoodooFest will be held inside and outside the shop on the day of Halloween, from 1 to 9 p.m. There you can shop for potion oils, gris gris bags, voodoo dolls, plus African and Haitian art; witness an ancestral healing ritual, or speak to the priests about this version of faith. Throughout October, the historic Hermann-Grima House, located in the French Quarter (820 St. Louis St.), changes up its historical tours to explore the mourning spaces of the 19th century. During a guided tour you’ll explore the property while learning about the religious and cultural significance of death for the Creole families living here in the 19th century (tickets are $15.45). You can also take any of the themed and historic tours offered this time of year, from the popular haunted tours to the vampire and voodoo tours in the French Quarter or the cemeteries tours in Mid-City or Uptown. One of the tours offered, the French Quartour Kids Spooky Tour, caters specifically to kids ages 5-10, leaving the gore out. 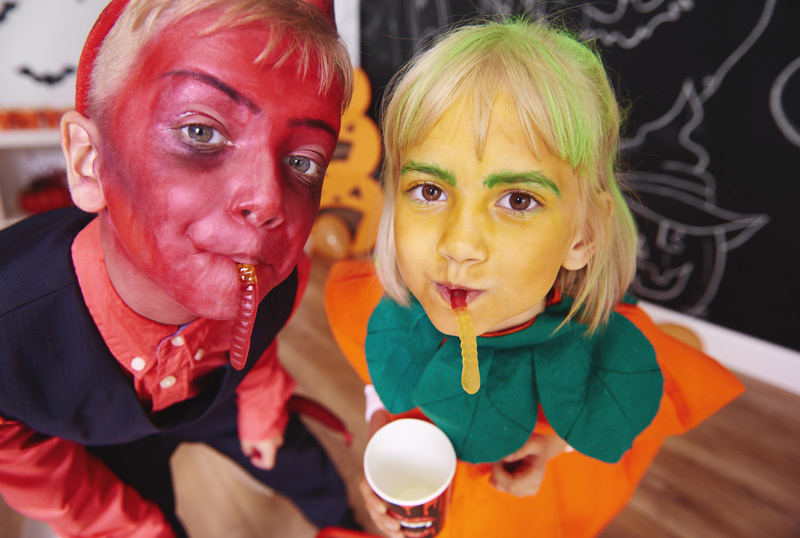 Speaking of the kid-friendly events, the French Market’s/Dutch Alley annual trick-or-treating event on October 20, the Boo Carré Halloween Haunt, as well as Boo at the Zoo, the Insectarium’s Crawloween, and the Louisiana Children’s Museum Mash are packed with holiday-themed activities. If you lucky to score a ticket, Ghosts in the Oaks, the three-day family-friendly extravaganza in the magical City Park is a local tradition. Older kids might also enjoy the city’s latest haunted attraction opening on October 5, the Scout Island Scream Park, also located in the City Park. Or, you can all trek Uptown to see some over-the-top decorated houses. The lawns at St. Charles Ave. and State St. and at Magazine and Second Streets, in particular, go above and beyond with scores of skeletons, holograms, music, and dazzling lights. Looking for some grownup fun? Strut your stuff and see some fabulous costumes on Frenchmen St. in the Marigny, where a massive street party has been breaking out for years on Halloween night. Things really get going after 10 p.m., and there are plenty of bars to duck in and out of to recharge and replenish. Website Design Company New Orleans | Click Here Publishing, LLC.